The data for these plots below was acquired from Kendo Culture of the Sword by Dr. Alex Bennett. As usual, his books a small masterpieces chocked full of knowledge. I have assumed that being the trusted scholar that he is, that the data is correct. He presented this data in a table but I decided to present it graphically to illustrated a few things. It is my impression that a lot of kendoka outside of Japan thinks everyone in Japan does kendo, they don’t. What I would like to bring the focus on are the large number of dan holders for 1dan and 2dan. They account for roughly about 75% of the registered dan holders as shown in the second figure. The numbers fall of at 3dan then rapidly drop for 4th and 5th. I would argue that the reduction in population for 3dan might have to do with students graduating from universities and then having limited time to continue their practice. The data presents us with a clearer image of the number of practitioners that are in the beginners ranks (1-3), that progress to that middle ranks (4-5), and ever make it up to the higher ranks (6 and above). A recent post on kendo ranks in the terms of academic ranking can help. Below is the population percentage of dan holders in Japan by rank. For the most part, those involved in kendo have an idea of the sparseness of female partitioners at higher ranks, here we can clearly see the rapid decline of representation after 3dan. If we consider that there are probably more female kendoka in Japan that in the US, I would venture that the decline happens after 2dan in the US in contrast to after 3dan in Japan. This could of course be extended to shogo title holders, but I think the data set would be so small it would be hard to draw any statistical conclusions. The results of this study could possibly be utilized to inform the AUSKF, EKF, FIK, and AJK communities of the current US kendo population and its evolution over time, with special attention to the increased internationalization of Kendo worldwide. It could provide evidence to support AUSKF’s policy for truncated training periods between rank eligibility for members over 60 years of age. Also, it may support the federations outlook of 5th dan as the starting rank for kodansha. Moreover, it believe it would provide a method of comparison to AJKF, FIK, and EKF populations and hopefully incite further global discussions. This is all but a thought. Lets see I can actually ever make this happen. In the meantime buck up and enjoy your time in the dojo. Categories: Kendo, Uncategorized | Permalink. The Japanese have six words referring to the intensity of training in any activity: keiko, renshu, shunren, tanren, kufu, and shugyo. The first four can be translated respectively as: practice, training, discipline, and forging. There are no adequate English words for the last two. Shugyō is the deepest spiritual training possible. In shugyō training there are two paths that may be followed, the first being the way of training the mind (kokoro) and the second of training the body( katachi) . Refining the self in shugyō is like forging a sword from raw iron ore. Fire, water, and iron are folded upon each other by the pounding of the hammer over and over again to create the cutting edge. One should keep in mind the principles of Shu, Ha, Ri, and be tenacious in the mastering of the fundamentals (kihon), so that the mind, the body and the weapon become one. If one delves into the kanji that make up the character, one finds Shu, which can be understood as practice or to engage in study; and Gyō, that can be understood as a juncture or crossroads. Hence, it is to persevere when one has reached a point where one has a choice to quit or proceed on the Way . Shugyō is the method of polishing the mind and body of a person through a means of rigorous training . If one engages in their training as such, the practitioner has the opportunity to refine not only their physical ability but the mental strength and stability in order to deal with the complications of life. The dojo is not a place that one retreats to in order to hide or escape from the difficulties of life , instead it is the place that one meets their true inner selves and thus aims to improve ones character and learn how to cope with real life. If a man is to know himself, he must be tested; no one finds out what he can do except by trying . This is the heart of Shugyō, an austere training where the limits of physical endurance and performance are surpassed, where only the strength of character and the will of the spirit fuels one forward. Trying and being tested is the proof of good men . Without Shugyō, all realizations are passing highs. The natural form of the body will not be developed, nor will the structures of mind emerge from the Unconscious; and a person will regress to egotistical patterns under pressure. If a person trains to attain enlightenment as an end, frustration and despair is inevitable for the Way is endless. But if you accept life as shugyō, see through both good and bad fortune as the effects of karma, and continually refine breath, posture, and awareness, then one day you will clearly realize the truth of the words of Master Dōgen, Training is enlightenment, and enlightenment is training. At the heart of this is to discover the truth for oneself. Therefore, it is of the utmost importance to keep in mind that one should never give up or quit. As one progresses in practice there will most assuredly come a time when the budōka questions his progress, or the reason for continuing in an art or way that is not popular and at times obscure. There may be times that he will be forced to confront the urge to quit as the demands of work, a spouse, or the aches of age become stronger. These doubts are not ones that will enter into the thoughts of an eager beginner as everything is quite exciting. But for the practitioner that has performed thousands of cuts in the refinement of his technique, this is a deep and important question. As now he has come to understand that the path of budō is an extremely difficult one; it is path that does not hold the rewards of fame and fortune. He may want to quit but he cannot, it is part of his life and he presses on in the spirit of shugyō. The purpose of the practice of Budō is not for the sake of physical technique or strength. We continue in our practice through the adversities of life, the bone chilly winters, the blistering summers, and the humbling injuries, because we have come to acknowledge and learn about our true selves. A sincere involvement in the practice of Budō provides us with the rare chance to face ourselves. From these encounters when the ego is stripped away, we come to realize the essence of Budō( 武道), the way. We practice for the refinement and polishing of our character and spirit. It should then be understood with advancement, what is meant by the saying, if the heart is not true and correct, the sword will not be true and correct . There indeed should be an ascension in the character, maturity, and development with the advancement in rank and age. This development should be as a person, a being of the universe. Our continued practice in these obscure ways, serves as a way to preserve a significant cultural jewel, to develop ourselves, and to strive towards realizing our potential. Thus, a Budōka becomes more potent in spirit even though the vigor of youth gracefully falls away as cherry blossoms at the end of spring. N. Hisashi, The kendo reader (1939). D. Lowry, The Sword and thew Brush; Shambala Publications (1995). Japanese-English Dictionary of Kendo; All Japan Kendo Federation (2000). L. A. Seneca, Dialogues and Essays; Oxford University Press (2009). M. Miyazako, Kendo is my philosophy; Taiiku & Sports Publishing Co.Ltd (2010). T. Shimada, Path of the Sword. This is a translation of an article originally published 2010 in the Nippon Kendo Magazine. 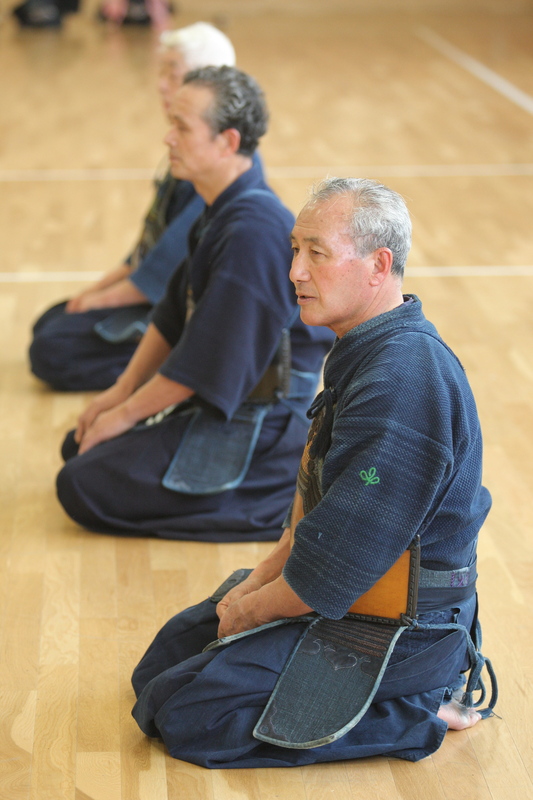 Endou Katsu is a 69 years old kendo hanshi hachidan. He spent his youth as a high school student at Iinogawa high school in Miyagi prefecture. It was there that he began to practice kendo under the tutelage of Matsugorou Takeyama and trained under Yoshihiro Nyuui. Upon graduating from the famous Kukushikan University went on to hold staff positions at Iinogawa High School, the 3rd Sendai High School, and Shida High School. He eventually became a school principal until his retirement in 2001. During the course of this time he additionally was the instructor of the Kenyuukai of Kano School for over 30 years until he took up the position as the Tohoku University Kendo Club shihan. Endou sensei has also served as an advisor and promotion council member for the Miyagi Prefecture Kendo Renmei, director of the Sendai City Kendo Renmei, Shihan and Official representative for the Sendai City Budoukan Kendo, and much more. A Myriad of unfailing wazas (techiniques) transmitted at the Nyuui Doujou Katsuo Endou Hanshi has taught a vast number of kids both as a high school teacher and also as a instructor at the kendo doujou. 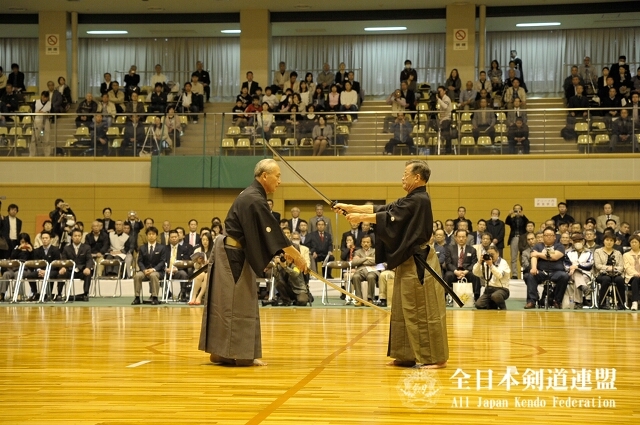 Following his retirement from the postof a School Principal in 2001 he has been employed as the shihan (head instructor) of the Kendou club at Tohoku University in Sendai. The cornerstone for his instruction to university students is based upon the fundamentals he learned during span of his high school years. The substantial amount of wazas that Endou Hanshi was introduced and became proficient in, when he practiced at the Nyuui Dojo in Miyagi Prefecture, were specifically targeted towards detecting the very instant when an opponent is coming and dealing with it without hesitation or failing. The following oration is what we could hear from him at a practice session at Tohoku University. I began Kendo when I became a high school student. It was at this time that I met my former teacher, Matsugorou Takeyama Sensei, at the language classroom. His sensei was Yoshihiro Nyuui Sensei. Aside from his activities related to the high school club, Takeyama Sensei also practiced at Nyuui Dojo in Sendai. I was fortunate to be taken along with him to practice and consequently, I was ”forged” by Nyuui Sensei. Training was intense, but without both Takeyama Sensei and Nyuui Sensei’s teaching method, that involved screaming harshly at me, I wouldn’t have come to understand the essence of what they were trying to teach me. Soon after beginning to learn, I focused on kendo day and night so much that I think I was even doing Kendo even while dreaming. Although I was thoroughly instructed on the basics, what these gifted Senseis specially taught were numerous wazas and the important points for each of them. An example of such would be that he explained This is what is important for this waza, ”The proper way of using this waza is as such.” I was taught the significant points to be mindful of with great detail and was actually able to the techniques during shiai. This helped to make kendo even more fascinating. When I continued my studies at Kukushikan University I further received a high level of instruction, but even today I can say without any doubt that the fundamentals acquired during the training as a high school student under Matsugorou Takeyama Sensei is the core of my Kendo. From the this framework I will describe the strategy of seizing the opportunity, enticing the opponent and when to strike. An important item was to learn to read the opponent’s state of mind or his actions, and interpret any slight movements shown by the opponent. If you decide on performing debana-kote, this does by any means mean that the opponent is going to accept such an invitation so easily. Take the situation in which you open up to the omote side while in the issoku-ittou-no-maai distance; It is not guaranteed that the opponent will decide to commit to a men attack. In such a situation, it now becomes a test and contest of endurance. It becomes a mutual contest of endurance, and a shorter distance is attempted. What is required here is the feeling of strength. Success is when the lured opponent struggles and attacks you and you can think to yourself, I provoked it. This is what is known as defeating the opponent before the strike. There are also points to be aware of in regards to the method of striking. Nowadays, it can be seen that when striking dekote the attack to kote is launched directly in from a frontal position, and subsequently after the strike has landed the body is allowed to scape to the right side. This however, makes it easy for the opponent to aim for a post-attack and makes it hard to reassume kamae. The teaching of Nyuui Sensei was to take the imaginary line extending from the opponent’s big toe on the right foot as reference to our fumikomi’s direction. 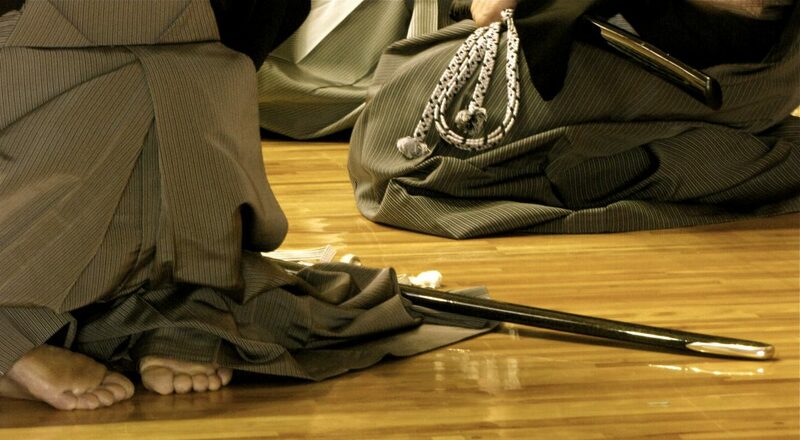 The imaginary line extending from the kensaki of your shinai aims at the chuushin of the opponent. This way it is easy to avoid hitting the base of the tsuba and on will be able to do a display zanshin based on a correct positioning of the kensaki and body posture, without worrying about a counter-strike being launched. Furthermore, I was also taught how to change to a men-nuki-kote as a reaction in case that the opponent’s men-uchi is too fast. Avoid the men by displacing to the left side and pressure the kote. If the kote cannot be struck, the strike the open men instead. Nyuui Sensei taught me the value of shikake-wazas regardless of the counter-reaction. He was very detailed about it not being about waiting for the opponent to initiate an action but to provoke it, that is, to cause it beforehand. If both opponents are aiming for debana-waza, then we must be able to see through this and invite his debana-men, and then we must reply using suriage-waza. As for the way of striking, specifially in terms of suriage-waza, I was instructed in the fine art of what to do under many circumstances, how should I perform in from omote, or from ura. I learned how the finer points of tai-sabaki (body movement). Most importantly, when mistakes were made, I received corrections addressing in which manner it should be improved. For example, ”If the distance is too deep, then lower yourself towards the back and the right” and so forth. Clear descriptions on the way of striking and leg movements were taught to me as part of a set of reactions to any situation. This ri-ai about the way to combat other high school students made it feel very interesting. In order to make his pupils aware of their own bodies, both Nyuui Sensei and Takeyama Sensei did hikitategeiko. That means that during seme-ai or kuzushi-ai, we were offered small openings (Sa!) from time to time, so we could learn to take advantage of them. They made us sense the moment prior to the origination or thought of the movement. It can be said that the importance of feeling the spirit’s movement just before a waza is performed is to experience that necessary instant where both theory and experience are combined and we understand that, here it comes!. Along with these lessons, we cannot lack the self-consciousness that even in our confrontational relationship, it is both of us performing kendo together. If one acts only upon one’s own body’s account there can be no success. If that takes place, then it becomes a dull and monotone combat which we call set-play Kendo. If one goes for set-play technique and scores by using it, then it may seems to work. However, if we use it and fail then the continuity of the combat is completely lost. If we have decided to use a certain technique and wait for the right opportunity but the opponent’s reaction is not what we intended and we fail to respond against that unexpected attack, then we will be hit. Nyuui Sensei taught us to continually apply seme until the very moment of definition, the spill point. I believe that by getting to know the opponent, by analyzing his way of moving, and by enhancing our waza, then this technique of provoking the opponent will luster and shine. In regards to the use of the sword, the right hand is the jitsu, (実) real, the left hand is kyo,(虚) emptiness. They are both needed and exhibit the dichotic nature when expressed in balance. But when facing an opponent meet kyo, emptiness, with emptiness. If your foe strikes into the emptiness, become jitsu. Become real. The stance of emptiness can only be met with emptiness. Both opponents, neither moving nor moved. No temptation. But the real demands the real. Reality, striking into emptiness. When unequal opponents battle, that decides the victor. The powerful sees through his opponent’s emptiness and finds the opening. When both are evenly matched it cannot be, no opening to be found for either. And thus, both strike the stance of emptiness. Wait. Patience. Tempt. He who is tempted…dies. Harmonize with the opponent. Meet emptiness with emptiness, the real with the real. 虚虚実実. Categories: Iaido, Kendo, Uncategorized | Permalink.